The Citizens Coinage Advisory Committee (CCAC) has set the time for its latest meeting to review 2009 Sacagawea Golden Dollar designs and edge letterings. The task of the CCAC is to review themes and design proposals for circulating coinage, commemorative coins, bullion coinage, Congressional Gold Medals and other medals. In their latest public meeting on Wednesday, June 18, the CCAC will follow up on business related to The Native American $1 Coin Act. 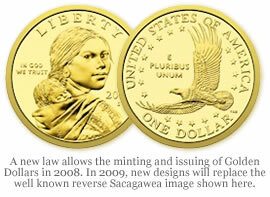 Current Sacagawea $1 coin have no edge-letterings — their surface is plain. The United States Mint issued 2008 Sacagawea Golden Dollars for collectors, but not for general circulation. Next year, the Sacagawea coins will make a comeback in force, as The Native American $1 Coin Act also requires Sacagawea’s to be issued at mintage levels equal to Presidential 1$ coins. After CCAC’s appraisals, they will advise and provide their recommendations to various parties, including the Secretary of the Treasury. The meeting is open to the public and press. Didn’t we have a 2 year run of “Godless” coins? With the economy the way it’s goin, who can afford to have money anyway? If we don’t have enough quarter designs, or 5 different dollar coins every year, we could always do a coin for all of the names on the “Wall”. Pennies are getting 4 new reverses too? With the onset of a major depression, I don’t want a wheelbarrow full of coins for a loaf of bread. I think they should do a $100,000 gold coin. Satisfy the morons that think these things up. Sell them to the morons that passed the bill. At least they can afford it. Make them wear one around their neck as a pendant.